Bring Rose Quartz materials in your house and invite happiness, wealth and prosperity. 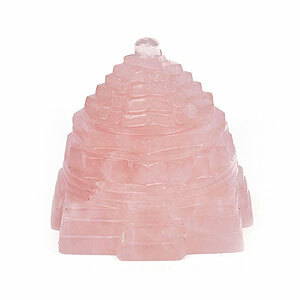 Rose quartz Sriyantra represents Goddess Laxmi, the Goddess of wealth and prosperity. It is said about this Yantra that it destroys the financial troubles and misfortunes. Besides this, it helps in maintaining the equilibrium between spirituality and materialism. Its auspiciousness bestows upon the native all sorts of peace and prosperity in life. Being in the shape of a Yantra Rose quartz doesn't work less than any powerful Talisman. It is universal truth that Sriyantra is the king of all Yantras and it is basically the coordination of 9 triangles. Rose quartz has been nomenclated as the substitute gem of the symbolic emblem of love. It is the most important substitute gem used for the attainment of mental peace and calmness of heart. Being the bestower of both wealth and peace its utility becomes more. Rose quartz contains a specific energy of very high magnitude which attracts happiness. Due to the effect of this gem the native residing in its vicinity attracts the help and cooperation of others and his humane qualities increases significantly. Rose quartz is not only beautiful and attractive in its look but its hidden power also makes it special. This Sriyantra can be established, visualized and worshiped both in the house and office. It solves all the problems existing in the house and the office. The powers enshrined in it, paves the way for income from multiple sources. 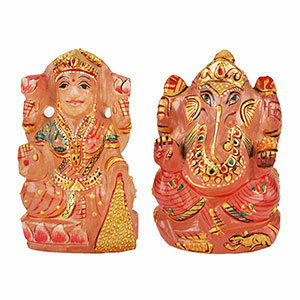 Its worship has been considered auspicious for the attainment of fame, success and honour. Rose quartz Sriyantra enables its meditator to get rid of all the evils and all the goodness enter into his life. It protects from all the evils in life. It is the best remedy for maintaining the stability in wealth and prosperity for very long period. Recite the following Mantra along with the worship of Sriyantra on crystal rosary for 7, 11 or 108 times. "Om Hring Shring Shukray Namah"
Important- The effect of Rose quartz gradually increase with the increase in its weight. In order to attain all its positive qualities it must be of minimum 150 gram. With the increase in its weight its result also becomes better. Hence a Rose Quartz of significant size only acts like all its hidden power. It solves the problems related to wealth in the house and family. Rose Quartz specifically increases love and harmony in conjugal life and maintains it forever. Its presence in the house gives birth to love, coordination and new energy in relationship of husband and wife. Presenting it as a gift to near and dear ones strengthens mutual relationship. It is specially used to resolve the broken relationship and igniting the spirit of love. Rose quartz is used to increase the self-respect and strengthens the self pride. Its power inspires to make love. From the emotional point of view Rose quartz is used to bring emotional balance and peace in life. This substitute gem establishes emotional balance and reduces tension and anxiety. All these qualities can be enhanced through forgiveness, tolerance and compassion and these qualities are enhanced by Rose quartz. "Om Drang Dring Draung Sah Shukray Namah"
Important- The effect of Rose quartz gradually increases with the increase in its weight. In order to attain all its positive qualities it must be of minimum 150 gram. With the increase in its weight its result also becomes better. Hence a Rose Quartz of significant size only acts like all its hidden power. श्रीयंत्र का पूजन करने के साथ साथ निम्न मंत्र का जाप स्फटिक माला पर ७, ११ या १०८ बार करें. "शुक्र मंत्र - ऊँ ह्रीं श्रीं शुक्राय नम:"
"शुक्र मंत्र - ऊँ द्रां द्रीं द्रौं स: शुक्राय नम:"